Thus in the Autumn of 1965, the first ever Old Griffins side lined up on Hackney Marshes to play their inaugural game. For those too tender in years to have experience Britain in the 1960s, 1965 was quite a year: The Death Penalty was still in force at the start of the year, only being abolished in the UK in November 1965. The Beatles had just finished their last UK tour and released Help at the cinemas. As the rugby season started, I can’t get no Satisfaction became the Rolling Stones’ first UK number 1. Harold Wilson was Prime Minister, and the Country was still recovering from the shock of losing Winston Churchill, who died early in the year. 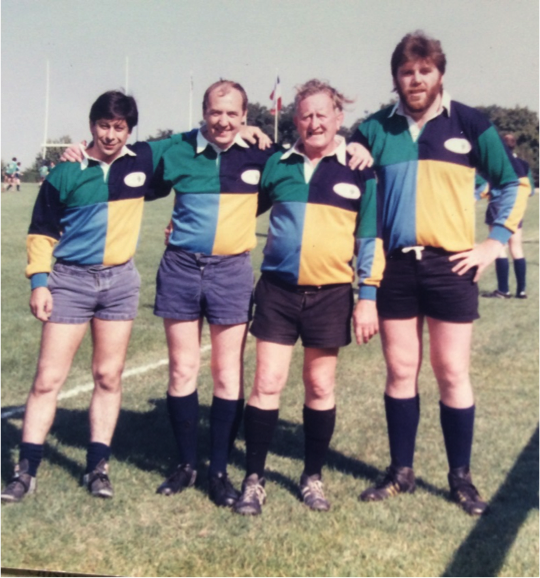 The Club played in the Old Griffins V-shirts, featuring the three colours of Woodberry Downs school, which they retained though into the 80s, when, after becoming Hackney RFC, the Club’s current four-quarters were adopted. The additional colour came from French side Suresnes, who the Griffins/Hackney are twinned with. 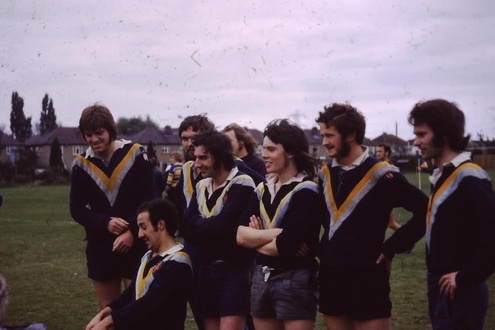 Below is a rare picture of the great Jim Smith (2nd from right) in the early 80s, shortly after the Club adopted the Quarter shirts, and the original team line up from that first game. The Griffins first game was not the only rugby event of 1965…in December of that year future England Captain Will Carling was born. However the Old Griffins first run-out surely stands as the most momentous rugby event of the year!